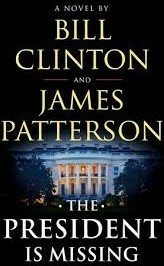 When the novel The President Is Missing by Bill Clinton and James Patterson was announced over a year ago, I wondered how much effort Patterson would really put into it. His novels are usually sloppy and filled with clichés. The chapters are usually really short and the characters are one-dimensional, if that. I figured Patterson would be more careful when working with an ex-President of the United States. Bill Clinton is known for being precise with words. He once argued over the meaning of the word is. When you write a book with a guy who argues about the meaning of the word is, you had better use precise language. The President Is Missing isn’t the worst collection of chapters that James Patterson has attached his name to, but it’s still pretty bland. The first scene is two chapters long with lots of long dialogue and almost no sense of place. All the characters talk the same way. When the opening scene turns out to be a fake out, I was mildly surprised at the set-up, but I didn’t care because the scene itself had been so dull. Mike Kearns is the chairman of the House Judiciary Committee and Lester Rhodes’s protégé. He likes to wear bow ties so we’ll all know how intelligent he is. Personally, I’ve seen Post-it notes with more depth. Sick burn. But the same thing can be said about James Patterson’s writing… I’ve seen Post-it notes with more depth. The word ridiculous is implied with the comb-over, and you don’t have to mention that it isn’t fooling anybody because you’ve just burned the guy over it. Patterson should know, you keep your insults short. Too many words can ruin it. For a fiction author, it has to be risky teaming up with a politician to write a book. I’m sure liberals a couple years ago didn’t want to give their kids a children’s book coauthored by James Patterson and Bill O’Reilly (who’s considered by some to be conservative and by almost everybody as a blowhard/ sexual harasser). Conservatives won’t want to read a political thriller coauthored by Bill Clinton and James Patterson. If one political side decides to boycott an author, that author can take that as a badge of honor to make money from the other political side. The problem is that a bunch of reviewers from the opposing side will spam the book with really bad online reviews. I think these political charades are misguided. I wouldn’t leave a one-star review for James Patterson just because he teamed up with Bill Clinton (or any politician); I’d leave a one-star review for James Patterson because he’s James Patterson. You don’t have to read a James Patterson book to know it’s one-star. The James Patterson book is assumed to be one-star, just like a comb-over is assumed to be ridiculous. Seriously, I don’t condone haphazardly leaving one-star reviews for books, not even for novels written by James Patterson. However, if I were to leave an automatic one-star review, it would be for James Patterson. But I wouldn’t want an ex-president to suffer because of my bias, especially an ex-president who’s never been accused of having a comb-over. Sounds like the best thing about this book is the title. Yours isn’t the most damning review of this I’ve read but it’s sufficient for me to give it as much of a miss as the latest Robert Langdon mystery. Haha! That’s true. The Atlantic (I think) had an article thousands of words long detailing everything wrong with the book. I almost got bored reading harsh criticism of James Patterson. I didn’t think it was possible.